The day after my return from India saw a couple of lineside visits to the Goblin for the Deviationer, Colas steel and a test train from Derby RTC. On Friday 17th I had to travel across London which gave me the opportunity of a few pictures both north and south of the Thames, including GBRf's 73s on the Northfleet to Willesden empty spoil box wagons. On Saturday 25th I took a few pictures around North and East London. On the first day of February I took myself off to Cholsey and Didcot for a very productive day. On Feb 15th I was on my way to North Yorkshire to visit family and stopped off for an hour at Whitley Bridge and Hensall in the Aire Valley. In an hour I saw one loaded coal and four empties! The following weekend I was in Lisbon, my first visit to Portugal's capital. It wasn't a train chasing holiday but Lisbon's public transport - trams, trains and funiculars - are very photogenic as well as being an integral part of the tourist scene. I must go again to seek out proper railway activity. 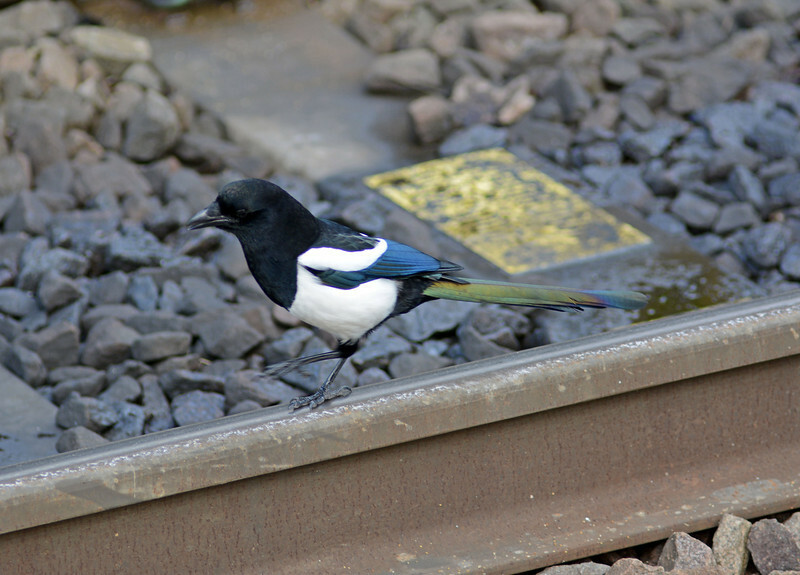 A magpie strutting along the track at South Tottenham.